Thanks, this looks great. I just tried it on Windows XP searching for a fixed string in the Emacs repository — took 28 seconds with a cold cache and only 7.5 with a warm cache, which is impressive. By contrast, “grep -F -R” (with suitable –exclude patterns, to prevent it from searching binary files and inside .bzr) took about 12.5 seconds with a warm cache. Are you a Bazaar fan and need some help explaining to others why Bazaar is cool? 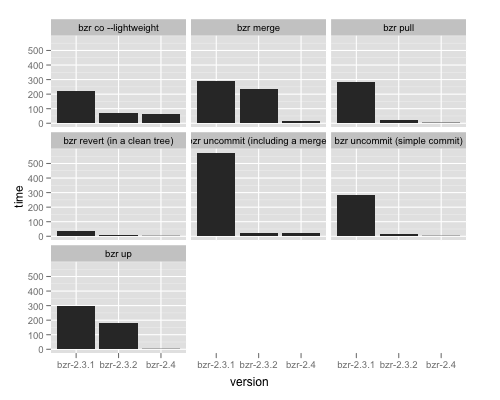 I published a document last week called Why switch to Bazaar? that may help. I’ve tried hard to present the big picture together with some concrete examples, explaining what we stand for and what that means to users, teams and communities in reality. Furthermore, if you tried Bazaar 1.x but found it too slow or inefficient, I’m sure you’ll find the Bazaar 2.0 benchmarks included in the document great news. I hope you find the document interesting and food for thought. If there are any mistakes or you’ll like to translate the document to another language, please let me know. The short story: brisbane-core has some good size and speed numbers; it’s now merged in to bzr 1.14rc1, so we can get wider testing across Launchpad and from users. We hope soon to have an “edge” Launchpad code server, which would be working on live data but running release-candidate bzr code for better testing. As fairly typical numbers for python3.0: fastimport time (similar to repeated commits) is down from 168m to 51m and the repository size is down from 160M to 77.4M. For MySQL the numbers are better, 501MB down to 170MB (nearly 3x). ‘log -v’ which was a particular point for emacs is now about 20x faster than in the 1.9 format. We don’t have to do much new development as such but we do have to do some more risk reduction, in checking for performance or functionality problems, and some further review before it merges. This testing and tuning will continue after it lands. There are still some operations that are known to be slower than in current formats, such as branching the whole repository, but they should be fairly shallow and are being worked on. (To be clear, they’re only cases where the new format is not as good as it will be, not regressions on current formats.) It makes sense to continue working on these in parallel with letting Launchpad and other people integrate it. The largest question mark is over how smooth we can make upgrading of stacked branches on Launchpad. This is important but probably something that we should tackle during the beta period, when other things are tied down. We will have a reasonable answer, the question is just how automatic will it be and where will it be done. Aaron is also now working on nested trees since the sprint and that seems to be going well, with the -subtree variant now obsolete. We’re aiming to do this for 2.0 too but won’t block finishing brisbane-core on it. Bazaar: Aaron Bentley, Andrew Bennetts, Ian Clatworthy, James Westby, John Arbash Meinel, Jonathan Lange, Martin Pool, Robert Collins, and Vincent Ladeuil. I’m glad all came, particularly those who had to travel a long way. support, allowing separate branches to be linked in as subdirectories. log -v is now roughly twice the speed it was before the sprint.